your business running safely and smoothly. C & J Electrical Services is a Southeast Michigan contractor focused on commercial and industrial electrical service, upgrades, and installations. We specialize in business relocations, new construction, machinery hook-ups, data and telephone wiring, and other complex electrical solutions. We strive to always provide competitive rates and top quality workmanship. Here at C & J Electrical Services, we believe in providing our clients with every convenience that we’re capable of, no matter how much extra effort is involved. Our certified master electricians have an array of well-stocked service vans, and are ready to provide the equipment and labor required to do the job right the first time. Our team is made up of licensed and insured master electricians. Centrally located in Farmington, we service businesses throughout Metro Detroit. Specializing in complex electrical issues for commercial and industrial properties. If you are searching for a new office location, moving your manufacturing facility or starting a new business and need electrical services call us today for a free quote. With a team of master electricians you can feel confident that the job will be done right and all necessary safety protocol will be followed. 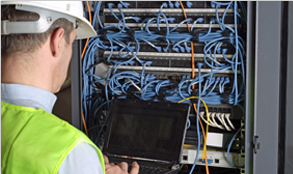 Our commercial experience includes wiring machinery, cable and telephone line installation and repair services. If you want to protect your business from interruption, call us to review options for standby generator installation service.